Moray Applegate is one of the longest tenured brokers in the Puerto Vallarta real estate scene with over 25 years of experience in the local market. 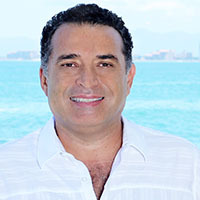 He is a second generation real estate businessman since his parents were founding fathers of the modern Vallarta residential market. His father Bernardo was instrumental in 1960s and 70s (along with his mother Teresa) with creating what now is the premier residential area in town along the south shore: Conchas Chinas. Educated in Mexico and California for English proficiency and got his Bachelor in the Jesuit Tech School ITESO in Guadalajara. Over the years Moray has representend hundreds of clients purchase, sale or build their dream vacation home. He is a founding member of the local Realtor Association (AMPI) and sits on the Honor and Justice Committee. He is also experienced on the north shore from Punta de Mita to San Pancho being instrumental in exposing clients to the area since 1992. He owns and runs as Broker “Applegate Realtors” the oldest and one of the most respected local real estate companies.